Cashton is the largest Wisconsin Amish community. Founded in 1966, the settlement had grown to 13 churches as of 2009 (see Amish Settlements Across America: 2008, David Luthy, for dates of founding and some church district numbers). The Cashton Amish community is a conservative group. Cashton Amish do not use indoor plumbing for bathrooms, and will have only cold water in homes. Cashton is a very farming-oriented community. Amish farmers supply milk for a local cheese factory. There are also some Amish-run businesses, many operated as sidelines. These include three hat shops, three buggy makers and a shoe store which keep the Cashton Amish supplied with clothing and transportation. Additionally, cabinet makers, metal shops, bulk food stores, a hardwares store and a clockmaker are found among Amish businesses in the Cashton community. The Hillsboro Amish community, founded in 1985, is located in eastern Vernon County. The Hillsboro settlements has roots in a Kentucky Amish community. At first glance, the Hillsboro Amish community appears to be one of Wisconsin’s largest, with 8 church districts. However, David Luthy notes that the Hillsboro districts are exceptionally small, in 2002 averaging 13 households per congregation–roughly half the size of the average Amish church district elsewhere (Amish Settlements Across America: 2008, Luthy p 8). The Amish community near the towns of Wilton and Tomah in Monroe County was founded just a few years after the Cashton settlement, in 1969. Amish at the time were likely attracted to the state for its strong dairy reputation. The Monroe County settlement is one of the largest in Wisconsin, with 8 church districts, (population roughly 1,000) as of 2008. The Medford Amish settlement in Taylor County, founded 90 years ago (1920) is by far Wisconsin’s oldest. Given its age, the Medford Amish community is relatively small, with only 3 church districts as of 2008. Medford is located in north-central Wisconsin. The GAMEO entry for this settlement notes that “Its cold winters have had an effect on the slow growth” in the community. Green Lake County is home to one of the largest Amish settlements in Wisconsin, near the communities of Kingston and Dalton. The Kingston/Dalton settlement was founded in 1977 and has grown to 9 congregations today. Clark County is located in central Wisconsin, and is one of the largest of Wisconsin’s 72 counties in terms of land area. Amish have found Clark County an attractive area and roomy enough for a number of separate settlements to have been founded here. The oldest Amish community in Clark County is found near the towns of Greenwood and Willard in the center of the county. Founded in 1975, this community numbers 2 districts today. The largest Clark County communities are at Granton (1981), in the southeast portion of the county, and at Loyal (1989). Both settlements are comprised of 5 congregations today. Two other small Amish settlements can be found in Clark County, at Owen (1991), and the much younger settlement at Neilsville (2005). Both consist of one church district as of 2008. Another noteworthy Wisconsin Amish community is found at Augusta in Eau Claire County, at 6 church districts in size. The Augusta Amish settlement was founded over 30 years ago (1978). Wisconsin is dotted with small Amish communities. Roughly 3/4 of Wisconsin’s 40+ Amish settlements consist of just 1 or 2 church districts. Wisconsin has experienced high levels of in-migration from Amish communities in other states. Nearly 30 Amish settlements have been founded in Wisconsin over the past 2 decades. Wisconsin’s Amish population has increased at a much faster rate than most over this 20-year period, gaining 150% as opposed to an average of roughly 100% (see Young Center, 2010). Older small communities are found at Blair in Trempealeau County, Spencer in Marathon County, and Chetek in Barron County. Younger small settlements are located at New Auburn in Chippewa County (1997), Taylor in Jackson County (1998), and near Platteville and Darlington in Lafayette County (1999). All of these young settlements have reached the level of at least 2 church districts. Though the long-term trend suggests high in-migration to Wisconsin, over the past five years (2005-2009) Amish communities in the state have actually experienced a net loss of population. The Young Center for Anabaptist and Pietist Studies notes that “Wisconsin had 236 new immigrant families in the five-year period, but it lost 325 families, yielding a net deficit of 42 households” (Young Center, 2010). Wisconsin is of particular significance in the matter of Amish education. A local conflict over schooling in a small Wisconsin Amish community eventually reached the U.S. Supreme Court, resulting in a landmark 1972 decision which effectively granted Amish and other religious groups the right to remove their students from school upon finishing the eighth grade. Conflict between Amish and school officials had occurred in previous decades in places such as Iowa, Kansas, and Pennsylvania, garnering national attention. Amish in numerous cases had been compelled to migrate to different locales were school officials were seen to be more lenient (resulting in the founding of new settlements, such as the St. Mary’s County, Maryland Amish settlement). The Wisconsin conflict, originating in a newly-formed settlement at New Glarus in Green County, resonated to the highest judicial levels in the country, and ultimately influenced not only Amish education but numerous other religious freedom cases. Local school administrators in Green County objected to the Amish practice of removing their children from school at completion of the eighth grade. In the fall of 1968, three fathers of Amish children aged fourteen and fifteen were arrested for refusal to enroll their children in high school. This refusal on the part of the Amish came in direct violation of Wisconsin law requiring school attendance until reaching sixteen years of age. 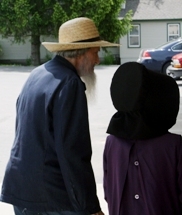 Though Amish generally refuse to defend themselves in court, the case was taken up by the National Committee for Amish Religious Freedom, a group which had been recently formed by non-Amish for the legal defense of Amish religious liberty. Attorney Willam Ball was hired to argue the Amish case. Ball maintained that state officials were in fact violating the religious liberty of the Amish. After hearings at local and state levels, the case made its way to the US Supreme Court. On May 15, 1972, a final verdict was delivered in the Wisconsin v. Yoder case. By a vote of 7 to 0, the Supreme Court Justices granted that both the First and Fourteenth amendments supported the Amish practice of removing students from school before age sixteen. The precedent set by this decision has essentially granted Amish legal protection, though certain issues such as teacher certification continue to pose potential problems in some areas (see Amish Society, Hostetler, pp 268-270; also The Amish and the State, “The National Committee for Amish Religious Freedom”, William C. Lindholm, and “First Amendment Issues”, William B. Ball). The New Glarus community, where the famous conflict over schooling originated, had disbanded by 2007, after over 40 years in existence. Wisconsin was also once home to a number of other now-failed settlements dating back a century. In The Amish In America: Settlements that Failed 1840-1960, David Luthy tells us that the Exeland Wisconsin settlement in Sawyer County, in the northwestern section of the state, was founded in 1909. 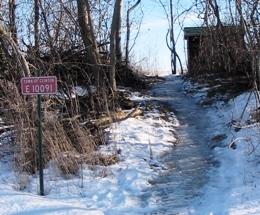 Amish from North Dakota, Montana, and Indiana were attracted to this area of “cheap, cutover timberland”, likely by a land agents’s advertisement promoting the inexpensive acreage. Luthy reports that Amish used dynamite to blast away at acres of stumps left over from the former forest land. Amish in this settlements operated sawmills, hunted, and grew an abundance of crops, including oats, sugar beets, barley, and red clover. Eventually this settlement disbanded in 1927, due to a “lack of leadership”(Settlements that Failed, Luthy, p 504). A second Amish settlement existed during this period in Rusk County, bordering Sawyer County to the south. Settlers from a Michigan Amish community founded a settlement near the town of Glen Flora in 1920. This settlement existed for about 2 decades, but eventually disbanded with the last Amish family leaving in 1942 (Settlements, Luthy, pp 504-509). A number of modern-day Wisconsin Amish communities ceased to exist in the first decade of the 21st century, including one at Viroqua (though 2 communities remain in this area), as well as Clayton, Downing, and Hilbert. All of these communities lasted roughly a decade or less (Amish Settlements Across America: 2008, Luthy). Wisconsin is a state which saw Amish arrive relatively late compared to other states associated with the Plain People. Though the first Amish only began to settle in Wisconsin in the early 1900s, the Wisconsin Amish presence has grown to become the fourth-largest in North America. In terms of Amish population, Wisconsin trails only Pennsylvania, Ohio, and Indiana, states which first experienced Amish settlement 50-100 years, or more, earlier. In Wisconsin, Amish have found an environment conducive to settlement. Relatively few Amish settled in Wisconsin before the 1960s, when the state began to see an influx of Amish which has only increased in each ensuing decade. One observer notes that “Undoubtedly the farmers were attracted to Wisconsin because of its highly rural character and its reputation as the nation’s “Dairy State.” (The Amish Struggle With Modernity, Luthy p 245). As long as Wisconsin offers affordable farmland and relatively isolated communities in which to settle, Amish are likely to continue to thrive in the Badger State. Yoder, Samuel L. “Medford, Wisconsin, Old Order Amish Settlement.” Global Anabaptist Mennonite Encyclopedia Online. 1987. Web. 25 October 2010. http://www.gameo.org/encyclopedia/contents/M438.html. If you can get yourself a copy of The Budget, that is THE Amish newspaper and they are listings in there for penpals—or you could put your own listing in there. I have read numerous postings and stories as well as the page to the link you mentioned on finding Amish Penpals. However, everything really takes you to having to be somewhere where there are Amish people. I currently live in Los Angeles, and would love to live and work on an Amish farm, and to become friends with and learn more about the Amish life style. However, there are no Amish settlements anywhere near LA… or California for that matter… So, since Amish don’s use the internet, how would I go about getting in touch with someone? They live near Shawano Wi. They have businesses look for them. They do you the internet. Yoder and store should be your search elements. There is a community in Madison, VA, and in Bonduel, WI (south of Shawano, WI) The list of communities is very incomplete. Other than Lancaster, PA, I would recommend Shipshewana, IN where their skills are employed by Coachman. Shipshewana is close enough to Chicago that it is a great two night layover to go to Amish acres. I am living in Madison, WI and searching for volunteer assembly work. I am also trained in office work. I sent two resumes to the Akron, Pennsylvania office today. My grandmother was mixed with Pennsylvania German blood and has Pennsylvania geneology somewhere but we know her from Rutland, Illinois. I have seen the Amish people outside but mainly just want to mention that I know about her industrious approach. I would like to learn more about this so I can concentrate better and nurture my interest in helping. I do not have it with me but I have a public aid case number. I also am a food coop member but not in Madison because I am in the process of joining a new one in Bloomington-Normal, IL. I have worked in Bloomington at the State Job Center as a temporary. I have a Social Security job list and have worked at four jobs in Madison since living here. I have also volunteered at the Dane County Farmer’s Market under Manager Larry Johnson. Was wondering if anyone could tell me on where any of the Amish are that make custom made furniture. Looking for someone who does quality work. Thanks for any help you can provide. There is an Amish gentleman near Marytown/St Anna area that does furniture and cabinets, etc. They also have a wonderful bakery. We’re not looking in any particular area for the furniture. We would go where ever and go spend the day and enjoy the adventure of our trip. We are south of Milwaukee. If you visit an Amish settlement, you can ask around. It lists Maple Lane Furniture and some cabinet shops. Thanks for the information. It is greatly appreciated. Hi, I live by the Tomah/Wilton Amish group and we have several that do great work. If you are still looking for this. Send email with contact info so we can talk. Hello, this post is a bit old but I am hoping there are still custom Amish furniture makers in Dalton, Wisconsin. I am looking to have a custom kitchen table made. Any advice that would point me to an Amish furniture builder is greatly appreciated. I write non-fiction books about personal experiences with the Anabaptists. But, I’m in my 79th year on earth and could defer to writers who have had or will have experiences with these pain people in the state of WI. I’ve written 8 non-fiction books about them, and working on 9 and 10, with room for your writings that have been read by a friend, and proofed by a proofreader. I’ll watch for your reply on this site. Google my full name to see what Amazon and others might be listing under other sellers. I have none of my books left out of 8,500 copies sold. I don’t live far from Walworth. Never heard of Amish in the area. What TV show are you watching? The producer of one of the escapades is from England. THERE ARE NO AMISH IN ENGLAND AND NEVER HAVE BEEN. How does she KNOW the real Amish? There aren’t any Amish in Walworth County. There used to be an Amish furniture store, but that closed awhile ago. There is a community west of Beloit in Rock County. Do you have the address of the store? I’m in New Berlin, WI. Any help with directions you can offer? I’m coming to an auction in Albany west of Madison. When and where is the Albany auction. Would like to go to it. What is the date of the auction? Do any of you know of any Benefit Auctions or meals between September 4th to 12th 2015 in Wisconsin? Please post here or please email me. Do you happen to have the phone number to the Amish that do the medal roofs? I live in Walworth county. There are no Amish. There are in rock co. The next county over. I could see the store owner not calling the police. He was ripping people off. But that store, and all their Walworth county footage is all scenery I have never seen before. There’s no settlement listed for Walworth County. Sometimes Amish spill over into the adjacent county, but this settlement looks like it is situated on the opposite side of Rock Co. Like others have said, I wouldn’t rely on much you see on shows like this. I got a flyer for the Marion sale this last week. It says Saturday June 7th @ 8:30. Pancake breakfast from 7–9am and school bake sale. 8:30am outside misc and inside crafts and furniture Quilts 10:30 and (more ) furniture at noon. Flowers and shrubs start at 9am. 4 miles South of Marion, or 12 miles North of Manawa on Hwy 110, or from Clintonville West on “C” to 110, then right on 110 to the farm. Watch for signs! I also have numbers to call if you have sell there. Are there any Amish Communities near Coloma, WI ? There is a small group of Amish that live between Wautoma and Coloma near the communities of Richford and Dakota. Well described, Patricia. I’d like to hear more about your experiences with the Wautoma Amish. Wautoma quilt and furniture acution is July 5th that I plan to attend. I’ve sold many of my 8 books at their auctions. I’m in New Berlin outside Milwaukee and looking for a place to stay the night before. any suggestions? I believe there is still a really nice Amish owned and run greenhouse in Coloma. I’ve seen several homes in that area. Can someone help: We love attending the Bonduel Wis Amish sales; but when is the sale in May of 2014 in Bonduel wis???? Hi Pam, Richard Dawley, who would know, just emailed me this: “Always the Saturday closest to Mothers Day.” Looks like for 2014 that means May 10th. The Bonduel Auction is always the Saturday of Mothers Day weekend and the nSaturday of Labor Day weekend each year. I’m looking for an Amish carpenter who will replace my Baraboo kitchen laminate flooring with a wood floor.Can you recommend someone I might contact? Thanks. I’m a Finnish excahnge student here in Wisconsin since August. I really find the Amish culture fascinating and a man in my Rotary club (I’m a Rotary exchange-student) had said he knew an Amish family and could take me to visit them which I think would be so interesting. The thing is though, that it might not happen now, and I’m wondering if there’s any opportunities to visit an Amish family for a day or so and see how they actually live and get to hear from them about the Amish culture. You didn’t say where you are located so it’s hard to suggest where you could go. Are you able to drive and/or do you have some friends that can? Some areas have Amish tours you might be able to take as well. Does anyone know date and location of Athens, Wisconsin Amish Auction? Do they have a phone number to use to get information from? Have addresses if anyone needs. I have been to the Bonduel Auction several times. If you could give the addresses of the other 2 auctions (Medford and Sheldon) that would be wonderful. Looking forward to hearing from you and where these auctions are locaed. I enjoy going to other Auctions. There is an auction in Hazelton, IA on Saturday, May 17th as well. Cecilia and Tonya, thanks for sharing here. Cecilia unfortunately I don’t have the details on the Athens auction. If you don’t mind sharing a few details for Hazleton, IA and the Wisconsin auctions you mention (addresses or start time or whatever might be useful) I’d be glad to add them to the list. For Wisconsin we currently have dates for Bonduel, Amherst, and Readstown listed (but no addresses or many details for any of them yet). Medford Auction: Location: Marvin Miller – W8332 Pine Ave., Medford, Wi May 10 and Aug. 16 starting at 8:30. From Medford, 7 Miles west of medford on CTH O to oak drive, 2 miles south on oak dr. to Pine Ave.
It’s on the 14th of June, Saturday. Sheldon is on may 2 and aug. 29 for 2015. Bonduel is may 9 and sept. 5 this year. Went to the Bonduel auction for the first time, was huge and great. Would suggest for anyone to try it. Lots outside, plenty of guilts, all price ranges, many flowers. People were very friendly and helpful, since this was my first time at this auction. I am looking for someone to fix the wood hub on a wagon wheel. I bought the old wagon at an auction but one of the back wheels is broken. Could someone tell me of a place I could get this fixed near wausau, WI Any help is greatly appreciated. In the 2009 Wisconsin Amish directory* it lists Henry Yoder in Edgar Wisconsin as having a buggy shop. I believe that is about 18 miles from you. I also have Aaron T Swarey in Athens, Wi. (31-ish miles away) No phone numbers are listed in the directory but there are address’s that I could give you if you email me. If they don’t work on wheels I’m sure they could tell you where to check. * note that 2009 directory is the newest Wisconsin directory. A new one is being made up now! any phone numbers, that would be great. I replied to your email address yesterday and to the email you sent me today. You might have to look in your spam/junk box to find them. Please reply to my email to let me know they arrived. Call Harlan Nolt at 715-267-7879. He is a farrier in the Greenwood/Withee/Thorp area. He would know who to contact. I know I have driven past a buggy shop on the way to Frenchtown Greenhouse but don’t know the name. The Amish Hazelton School Auction is on 120th Street in Hazelton, IA this Saturday. Help! Need a homemade pie today! Where can I get an homemade Amish pie today? I live in Milwaukee. Hi Monique, I don’t know where you can buy a pie locally, but there are several places online that will ship pies to you from Ohio and Pennsylvania. Miller Bakery will again be available at the Sheboygan Outdoor Farmers Market starting in June. Every Saturday at Fountain Park, Erie & 8th street. Pies, fry pies, donuts, and many other yummy things. Their bakery is located just east on Marytown on Hwy HH. (near New Holstein) They are open Fridays and Saturdays. Call 920-898-1193 or hours or special orders. Does anyone have directions on how to get to the Amish Walmart by Cashton, WI? I hope you get a more precise response than what mine is going to be, but if not, maybe I can get you closer to what you are looking for. Two weeks ago I was in Wisconsin and got one of their old Amish directory’s for the state. In it most Amish folks listed if they were farmers or worked in a sawmill or whatever. Cashton, as you might know, has lots of Amish people. I saw that one had a “Coleman shop” while others had a shoe store, bakery, farm store and bent and dent. I would be happy to pass along the address for any of those if it sounds like what you might be looking for. Where did you get the Amish Directory? I first borrowed one from a Amish family that had moved from Wisconsin to Pawnee City Nebraska. Then, while visiting some of the Amish in Wisconsin, I inquired about who might have one for sale. Not only did I find one for sale but everyone talked about how the new Wisconsin directory was just about ready to come out, so I put in an order for a couple of copies of the new one when it is available. (this was back in early May 2014) I have not received a new directory from the people yet, but I would assume one is out. I live in Westfield, Wisconsin. Wondering if anyone knows of any Amish that sell Raw milk cheese near by? I might not be much help… but per the Amish Newspaper “Die Botschaft” it appears there are either Old Order Amish or Horse and buggy Mennonite in the following city’s near you. Using Google maps I come up with the distance. Using the 2009 Wisconsin Directory I came up with how many church districts 2 of them have. (the other are not in the directory. That could mean they are new or that they are listed as a subset of one of one of the bigger communities. The new Wisconsin directory might be out now, but this is all I have to work with. I didn’t take the time to look up who sells dairy products in Wautoma & Kingston but if you email me and let me know if either of those work for you I can give you some names and address’s. Unfortunately the Wisconsin directory did not list any phone numbers. Is their a link or address to the WI Amish newspaper? Wisconsin probably has their own reginal Amish newletter(s) or small paper but I don’t know the name of it/them. The main Amish papers, Die Botschaft & The Budget. Neither of these two will have any link to read online. They are not like the English newspapers that list National/local/sports/weather in them rather they are notes from each community as to what is going on. A typical one will list what the weather is doing, what they are planting or harvesting, where gmay (church) was held last time and where it will be the next time “Lord willing.” Then they will list people that attended gmay, or a wedding, if someone is sick or fell from a roof or was kicked by a horse, or had a snake come in their house. Some of the writers are fun to read because of their style of writing. Was there anything specific you hope to see in the paper? Hold on, Tom, you’re telling me that the Amish press publishes who attends church? Can’t that be a little bit prideful of them? I mean, reading a newspaper and seeing one’s cousin was in an accident, for instance, is one thing, but reading a paper and seeing who did or who did not attend a service might be a bit embarrassing, can’t it? And a bit boring if your there every Gmay and see the same people over and over again? I’m not making fun of the practice, mind you. To be a little more specific… they will list what visitors from other communities attended… not everyone. For the wedding notes they sometimes will list all of the servers and bridal people. As far as pride goes… I wonder if they look at it as more just stating the facts. I was amazed by one scribe that mentioned three women in their community that got new dentures to wear. She listed all 3 of the womens names. In the English world I think most people would not want that broadcast by the scribe told me that it was no big deal in the Amish world. Mmm, I’ll chalk one up to learning something new everyday. First, I really need to proof read what I say for errors. I wish we could edit what we say. Anyhoo… if you would like me to take a couple of pictures of scribe notes from your area I can email them to you. Feel free to email me at my address below. expenses recently incurred by a family through childbirth. There is no Amish paper in Wisconsin. None of the Amish in Wisconsin want you to take a picture of them or their property. They are unlike Pennsylvania Amish, do not know what Rumspringa is and do not bike, rollerblade of play badminton…..only baseball. Who cares what they they write in their paper. Anita, I know plenty of amish people, in Waupaca and Shawano Co.) who do the exact opposite of what you say, I know some who allow pictures of them working their land as long as you can’t see there faces. A family in Binduel actually writes a quarterly article for a Wisconsin Magazine. I know some who rollerblade, play volleyball, and so on. Each amish community differs from church district to church district. Anita, I know plenty of amish people, in Waupaca and Shawano Co.) who do the exact opposite of what you say, I know some who allow pictures of them working their land as long as you can’t see there faces. A family in Bonduel actually writes a quarterly article for a Wisconsin Magazine. I know some who rollerblade, play volleyball, and so on. Each amish community differs from church district to church district. We visit Wisconsin Amish communities twice each year and love every minute of our trips. I am looking for any Amish restaurants or places to stay. I would also like to find Amish Apple orchards. I would appreciate any information that anyone can give me. I don’t know that I can be of much help, but whomever is will need to know where in Wisconsin you plan to go visit. Is the whole state open to you or are you looking within a certain area? You might mention also a mileage range you are looking to go from. Say, 100 miles outside of Madison… or Green Bay or such. Wisconsin is a big state. After I posted, I realized I hadn’t given an area. We will be in the Eau Claire area, the Dalton area and the area below Tomah and Sparta which is our favorite. I am amazed that we don’t find Amish restaurants and would love to know of any. We have been to the orchards around Gays Mill, but would like to find some closer to the Sparta area. I am so thrilled to have found this site and will follow it closely. Have you been to any of the auctions? We have been to a couple at Cashton, and just love them. We were even fortunate enough to have attended a couple right on the farms. The auction house at Cashton is right behind the creamery which is a “must stop” each time we go on this trip. I am looking for someone to process chickens for me. I live in the Madison, WI area. A friend of mine takes hers to an Amish farm near Mineral Point, WI but that is to far for me to make it economical enough to drop off chickens come back home then pick them up that evening. Anyone have any ideas? I live in Coloma Wi which is an hour from Madison. There is a Amish farm up here that does do Chicken processing. I can send information to you if your interested! I’m looking for Chicken growers: Quantity 3,000 per week on a consistent basis. Please drop me a note if anyone is interested? Can anyone tell me of any Amish stores, etc near Medford or Thorp? My boyfriend and I are about to buy land in the Vernon/Crawford County area and want to get an Amish log cabin! I looked online, and sure enough, there are folks that contract on behalf of the Amish to host a website in order to sell cabins. 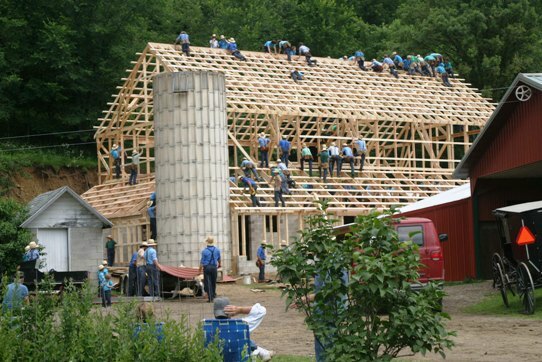 My question is, are there any Amish builders that you can contract directly with, is that something that they’d be OK with, or is it preferred that we work with the middleman? Driving to the property on Hwy 14, we came across a builder with models out front, but naturally, we don’t want to be rude and knock on a door without a bit of knowledge beforehand. Any advice or names of builders that anyone has experience with would be helpful. The cabins we looked at were super cute and so much more affordable than the “brand name builders” around Wisconsin. How can I get in contact with an Amish community leader (like a bishop) in Kingston or Dalton? I’d like to spend a few days learning from their faith. Should I simply show up in the area and look for one? Hello, I need a Amish roofing contractor. The one we did use in the past supposedly moved, Alvin Buckingham, A&J Construction. In the Wausau, WI area. Please help! dan smucker roofed my house and did a great job. he is on cty “h” in the Dalton area. take 44 west out of Kingston about 4 miles. cty h will be a left only turn. dans house will be the first house at the top of the hill on the west side. Does anyone know of an Anabaptist church near Madison, Wisconsin that the service is given in English instead of German? Hello, I am looking for an Amish Builder to build me a pole barn or something similar. 35’x60′ size. Can anyone give me a name and # to a perspective builder. garb. There are also Plain Catholic families in a few more states other than WI. I can remember in the mid-1990’s going with a friend to a bakery at St. Anna. Over the years I have forgotten the address of the bakery, but haven’t forgotten the heavenly food that we brought home that day.Is the bakery still open? If it is open, could you please post the hours and the address of the bakery? Thank You!! The original bakery is no longer in business, but there are two newer bakeries in that area. Miller’s Bakery will be opening for the season again on April 28th. They are open most Fridays and Saturdays. They are located on Cty HH about 2 miles east of the Marytown bank. They do also offer some items at Pipe Express, the BP in Pipe. I am looking for some Amish Contractors in the Fond du Lac WI are that can finish taping and mud some drywall I installed. I ahve the supplies. You can call Noah at 920 898 5363. He is in the Marytown area. Somewhat retired Amish house builder. If he isn’t interested, he will know someone in their community that might.